This is a really satisfying breakfast that is perfect for weekend mornings. 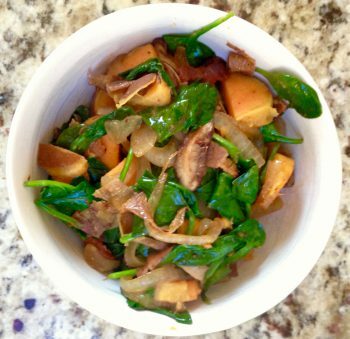 What makes it thoroughly satisfying is the blend of flavors lent from salty, smoky bacon paired with the sweet from the sweet potato, sweet and pungent onion set the stage for earthy shiitakes. There is always room for spinach, so that goes in too. Slice bacon and place in a cool pan. Put pan over low heat to render the fat slowly. This will make the bacon crispy all the way through. Stir occasionally until bacon becomes desired crispness. Drain off excess fat, reserving about 1 T. in the pan for sauteing. Add onion and sprinkle with a dash of sea salt, stir. Let onion cook until translucent over low-medium heat stirring occasionally. Now add shiitakes, a dash of sea salt, the sweet potatoes, a dash of sea salt and the spinach with a teeny bit of sea salt. Do not stir yet, the order in which these veggies were added to the pan will allow them to cook just as is, in the pan for 3-5 minutes. Now, stir until spinach is wilted and serve. This would be good topped with an over easy egg or hollandaise sauce. A breakfast fit for one, but can easily be doubled or quadrupled.